The Therma-Stor HI E Dry 100 Dehumidifier is a medium to large capacity unit designed for commercial applications and for use as an indoor pool dehumidifier. The design emphasises energy efficiency and durability and is compact and portable. The 100 is suitable for stand-alone or ducted installations and has a wide operating temperature range. The unit is suitable for medium to large areas up to a maximum of 2,500 square feet. In addition to its high energy efficiency the design of the 100 contributes further to protecting the environment by using R-410A refrigerant which will not deplete the ozone layer. The HI E Dry 100 Dehumidifier is optimized for use as an indoor pool dehumidifier and for other commercial applications in high humidity areas. It is suitable for use in health and fitness applications, such as gymnasiums, hospitals and skating rinks; utilities installations, including pumping stations, power and sanitation plants; archiving centres, libraries and art galleries for example; food and drug related establishments such as bakeries, pharmaceutical labs and restaurants; manufacturing locations, paper and pulp production, packaging areas and processing facilities; graphics areas including printing, photo labs and silk screening; and computer or electronic assembly rooms. It is also very suitable for use in a wet basement. 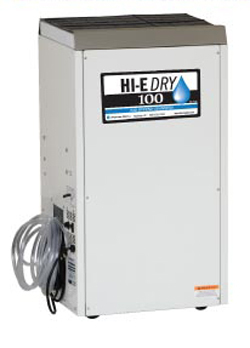 The HI E Dry 100 Dehumidifier is a powerful unit and, in AHAM standard conditions of 80°F and 60% relative humidity, will extract 106 pints of moisture per day. Extraction rates vary with changes in one or both of these parameters and in extreme conditions of saturation the unit will remove as much as 212 pints in 24 hours. The HI E Dry 100 Dehumidifier will perform effectively within a large temperature range from 110°F to 33°F. Its low temperature operating capacity is enabled by use of an effective auto-defrost system which actively melts ice as it forms on the condensation coils. The HI E Dry 100 is a highly energy efficient dehumidifier. The unit pre-cools air entering the dehumidifier allowing more moisture to be extracted form that air as it passes over the condensation coils. This accelerates the reduction in relative humidity and improves efficiency by as much as 200% manufacturer's estimate). It also allows very low relative humidity, down to 20%, to be achieved. In addition to the cost savings this efficiency provides it is also beneficial to the environment, as is the use of the eco-friendly R-410A refrigerant. Relative humidity is regulated by means of an adjustable humidistat at any level between 20% and 80%. Once set the humidity control is automatic with the machine cycling on only when the desired level of RH is exceeded and cycling off when the level has been restored. This not only maintains RH within the required parameters, without human intervention, but saves further energy by preventing the machine working unnecessarily. The condensate is disposed of by means of continuous drainage and the HI E Dry 100 Dehumidifier incorporates an integral condensate pump and a 20 foot drainage hose to achieve this. The pump will provide up to 17 feet of vertical lift allowing discharge to a drain above the site of the unit if this is more convenient for the operator. The 100 provides the convenience of multiple installation options. It may be used as a stand-alone dehumidifier, within the area to be dehumidified, or with a choice of using one or both of the options for ducting incoming and/or outgoing air flows, may be used across a number of smaller enclosed areas or in a location enclosed from the dehumidifying area to reduce noise nuisance to customers and to preserve the aesthetics of a public space. Installation is simplified by the HI E Dry 100's ability to operate from a standard 115v circuit, another benefit of its energy efficient design. The 100 also offers superior air filtration capacity by means of dual air filters each of two-inch thick pleated MERV-11 standard design which are both washable and replaceable. The blower may be operated independently of the dehumidifier allowing continuing air filtration at any time. The unit is compact for a dehumidifier of its capacity and measures just 20 x 17 x 36 inches. Its weight is a manageable 110lb and movement is made easier by the provision of four caster wheels. The 100 is a durable unit with robust internal components enclosed in a steel cabinet. The unit comes with a five year warranty on the sealed refrigeration system of which the first year covers all parts and labor.